will this fix the stuck notes? The problem I have (and have always had) is the multitimbral function. Whether in Pro Tools or Logic, any time I load a VSTi like Omnisphere, for example, ALL channels will control everything. I can set the MIDI properly on the MPC, set the channel properly in the instrument AND set the channel in the track in the DAW but it just will not separate performances. Highlighting the tracks, record arm vs not, every combination of procedures you can think of and it just will NOT work right. I choose a synth in channel one, choose channel 1A on the MPC and record. no problem. Go to Channel 2 in the Synth, new sound. change the next track in Logic to MIDI channel 2. new track in the mpc, set it to 2A....and that's where the problems start. the performance of track 1 will still override everything, no matter what. Honestly it's driving me to abandon my 5K and look into the new Maschine Studio. The other problem I have never been able to solve is no matter HOW you record midi into the mpc (I use a M-Audio Keystation 88es for the record), once you stop the sequence and hit start, ALL notes go to full volume, each time. If i turn the volume down in the VST, once I hit play, it shoots right back up. All VERY frustrating. I guess I could slave the MPC to the DAW, but then that would defeat the whole purpose of having a hardware sequencer if I have to sequence midi in the computer and only internal sounds of the MPC via itself. smh. Tutor has you covered. its covered in this ebook. (if i understand your issue correctly) trust me you will have no more issues with this. BxJaze wrote: The problem I have (and have always had) is the multitimbral function. Whether in Pro Tools or Logic, any time I load a VSTi like Omnisphere, for example, ALL channels will control everything. I can set the MIDI properly on the MPC, set the channel properly in the instrument AND set the channel in the track in the DAW but it just will not separate performances. Highlighting the tracks, record arm vs not, every combination of procedures you can think of and it just will NOT work right. I choose a synth in channel one, choose channel 1A on the MPC and record. no problem. In Pro Tools, you need to make sure that the Instruments section of the Mix or Edit Windows is visible, from View menu, and then set the MIDI input device and channel for each track as you require them, instead of taking the MIDI input from 'ALL' channels. 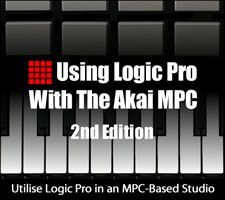 In Logic, in Project Settings/Recording, in the MIDI section, make sure that the 'Auto demix by channel if multitrack recording' checkbox is ticked, set the desired MIDI channel on each instrument track in Logic, record enable all the MIDI tracks that you want to control from the MPC. Yeah, I've got the hang of this method and I think I'll stick with it. But I saw a demo (which i got to work ONCE for a few seconds before I made one change and screwed it up, never to get it working again) where a guy made a MIDI Environment in Logic where he created a Physical Input, and Multi Instrument and a Channel Splitter. He ran the port of the USB MIDI Interface (as configured in Audio MIDI setup in the OS X Utilities) to the mulit instrument, then ran that through the channel splitter. That way no tracks had to be record-armed. he simply loaded whatever he wanted and changed channels in the MPC and it all controlled perfectly. Oh well. I definitely appreciate the response. psr wrote: Tutor has you covered. its covered in this ebook. (if i understand your issue correctly) trust me you will have no more issues with this. BxJaze wrote: But I saw a demo (which i got to work ONCE for a few seconds before I made one change and screwed it up, never to get it working again) where a guy made a MIDI Environment in Logic where he created a Physical Input, and Multi Instrument and a Channel Splitter. Yep, that is another method, take the MIDI outputs from the Physical Input object directly to channels, rather than from the Sum output to the Sequencer input as is standard. Does get a little confusing for beginners though, so I didn't mention it. If you want help getting that method going, let me know, will try to help. I'm trying to see how well I can work with the first method but i'll definitely keep the other option open if I find it can be more productive. I remember reading the mention of it years ago but have never been able to find a solution, either online or alone. Is the volume jumping issue in Logic? Maybe go into the event list view for the tracks where it is happening, and make sure that there are no MIDI CC volume messages that are changing the volume? Also maybe check that there is no volume automation on those tracks? SimonInAustralia wrote: Is the volume jumping issue in Logic? Happens both in Logic and Pro Tools. Fresh out the gate. I don't set any type of volume-related automation or anything. How would I check what messages are going out? Forgive the ignorance, I'm relatively new to Logic, btw. Logic displays incoming and outgoing MIDI messages in the transport window. You could also run a utility like SNoise MIDI Monitor. Strange that it is happening with both Logic and Pro Tools. SimonInAustralia wrote: Logic displays incoming and outgoing MIDI messages in the transport window. Funny thing just happened not even a minute ago and I found it out completely by accident. Turns out it's the Q-links. They are sending a message to whatever track is selected. But only Fader Q1 and knob Q5. When you go to MIXER MODE and go into the "TrkMix" tab, Q1 and Q5 automatically control the selected track's volume and pan in Logic. By default, the values of all tracks in the MPC are all the way up, so THAT message was being sent to Logic. So if, for example, I set the volume half way down and the pan hard left, no matter what screen I'm in on the MPC, the selected track in Logic will follow suit the second I press Play on the MPC. Whatever value those two Q-links are set to in TrkMix will automatically be sent to the selected track in Logic. So I guess what I need to do is figure out how to stop the Q-links from sending data. And in even more confusing news, all midi control numbers in the Q link edit screen are set to OFF.....this is getting weirder by the second.